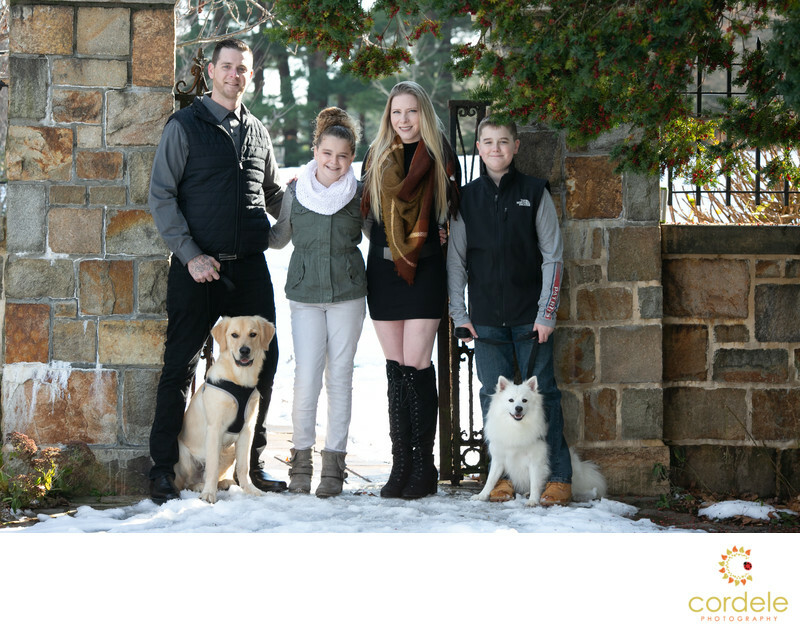 A family of four is hard enough to capture, and then you add dogs while at a bird park in Walpole? Yes, it's possible to still get a great photo! With any portrait the main idea is to get everyone looking beautiful and making eye contact with the camera. The humans are the easy part, it's the dogs that are the hard part! I personally love dogs, so I have a few tricks up my sleeve that make the process really easy. First, you want to make sure the dogs are able to be in a public setting and not be too crazy. I try to select an area with low people traffic as to not distract the animals. I can't help the occasional squirrel that goes by, but I can try to find where less people will go. Next you get everyone situated and then add the dogs. Hopefully the dogs can sit for a quick few seconds! Then I get everyone looking at me, take a few frames, make sure it's in focus, and well exposed. Ready for the trick? Then I whistle! Both dogs instantly look at me, but you have to be ready for it. If you are not, you're going to miss the moment because there is a crazy squirrel dancing to your left. Bird park was built in memory of Francis Bird who died in 1918. It's a wonderful park for taking a bike ride, going for a walk, or capturing your family photo! Location: francis Bird Park, Washington Street, Walpole MA.